In the last week or so, the air has warmed up considerably. 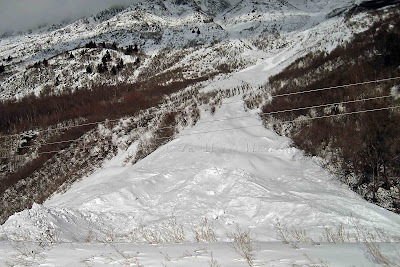 Unfortunately, this means dangerous and terrible conditions are occurring to the snowpack in the backcountry, and over the weekend we lost at least 3 Alaskans to avalanches. I lived for a time in Valdez, a beautiful little town with magnificent mountains serving as its backdrop, and I vividly recall a crisp morning when I was walking to the bus stop in the cold of early spring. I heard several sharp CRAAAACKKKs in the distance, followed by a low rumbling that grew louder and louder. The thundering seemed to echo and bounce off the ring of mountains encircling the small town. I tried not to panic as my young mind attempted to process the unfamiliar sounds. An earthquake about to hit? A military convoy approaching? I later learned that I was hearing the snow—miles away and back in the mountains—breaking off at the top and sliding down, gathering force and momentum. Avalanches. Seward Highway connects Alaska's largest city of Anchorage with the Kenai Peninsula, and every year cars are prevented from passing through certain sections due to natural obstacles. In the summer, it might be a rock slide that tumbles down a mountain and onto the road. In the winter, snow slides shut down the highway—sometimes for a couple hours, sometimes for a couple days—until maintenance crews can clear a safe passage. This is the remainder of a small slide that had covered a portion of the road, but was quickly cleared. You will see at least 5 of these when you drive a particular 40-mile stretch of road that winds along the base of the Chugach mountains outside of Anchorage; fortunately, most slides peter out before reaching the highway. 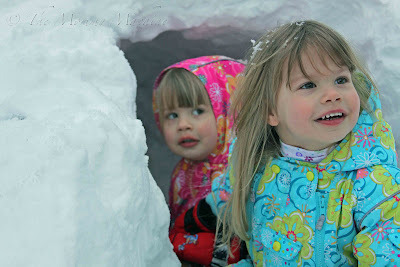 My girls have dug a labyrinth of tunnels through the snow in our back yard, but as of last Friday, they are now forbidden to crawl around in them. Chances are that if the melting snow did collapse on them, they'd be just find and could stand up easily . . . but I'm not willing to take those chances. Stay safe! Here I thought Texas was dangerous. Although I don't know what is worse, avalanches or rattlesnakes. I had the same thought about our snow tunnels. Over the summer some kid suffocated in a tunnel he dug in the sand at the beach. So many scary ways to have terrible things happen! And speaking of scary - I'm glad we don't have to worry about avalanches around here. Hope you don't run into any more of those! Even though I've never really lived in the mountains and didn't visit them often as a kid, I've always had this weird fear of avalanches. I don't know why. When I was little, we always used to make snow caves with my dad. I could only stay in them for a few minutes, because I was sure it was going to collapse on me. That is scary stuff!! I saw a video of an avalanche a long time ago and, wow, it's just disastrous. Love the picture of the girls...their cheeks are so rosy red from the cold! !